Wow! Thanks to All Free Sewing for including me in their list of Top Bloggers! My Adult Bib Apron made it to their list of Top 100 Sewing Projects! Here’s my adult bib/apron that you may have seen before. As you know, I love practical and pretty things. And this fits the bill! It can be difficult and degrading for adults who have difficulties eating to cover their clothing without making them feel like they are a child. 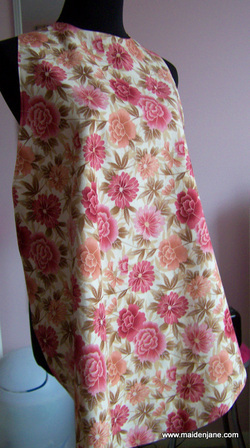 I created this modified version of my apron to attach simply, cover the neck area, and also cover the lap. I love creating tutorials and working with All Free Sewing has been wonderful. You can check out all the projects by heading over to their website!